I am a string specialist. 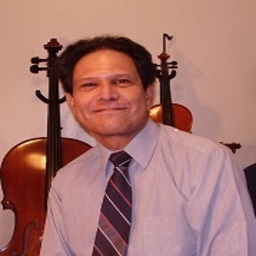 That means I teach and play violin, viola, cello, double bass, guitar, bass guitar, mandolin, ukulele and piano. I believe that any student will practice more if he or she likes the music they are playing. Periodically I will ask a student to give me a name of a piece of music that they would like to learn how to play. I notate it for them, often simplifying the rhythm and chords in Finale NotePad and give it to them free of charge. I teach students how to play music on their given instrument. Not just how to play the instrument but working on technique, finger dexterity, expert note reading ability and total musicianship. I also teach students how to play a piece of music that will move the audience emotionally. I earned my B.A. in Music Education from the University of Northern Colorado in Greeley, Colorado with a double major in Double Bass and Classical Guitar.